Oh My Goodness! Imagine being able to make your own earrings: as long or short as you want, in the colors you prefer, using your choice of premium materials. Students will discover easy ways to cut chain lengths quickly, how to choose gemstone/pearl/crystal combinations, how to make ear wires, and more! 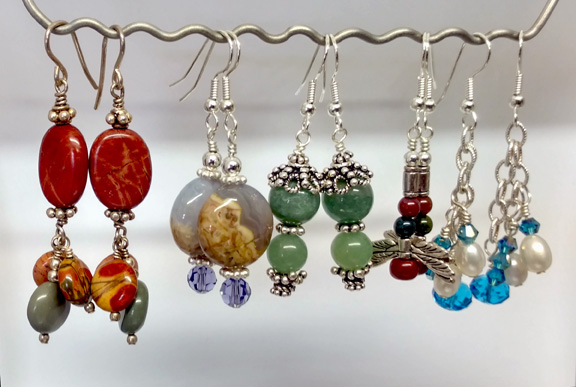 The workshop fee includes: teacher’s fee; all necessary silver wire, beads and chain; gemstone, pearl and crystal beads to make 3 different pair of earrings, and written follow-up instructions. Instructor will have tools for everyone to use in class, or you may bring your own: flat, chain and round nose pliers; wire cutters; foot long ruler; work surface; ultra fine marker. Please bring your camera to take photos of difficult steps! Cancellation policy: no refunds will be given after January 13, 2017.